Furesø Municipality has successfully brought green mobility into the everyday lives of people of all ages - particularly adults with disabilities. Furesø Municipality has taken action against climate change by appointing municipal office managers as Climate Ambassadors, who have developed the project Climate Bikes for Children and Adults. Together, they have created a number of concrete ways for employees in the municipality, children and adults with disabilities to contribute to society and Furesø’s climate efforts. And in this effort, the bikes play a key role. A total of 130 bikes have been distributed to the municipality’s offices and institutions. Through various campaigns, Furesø has been encouraging its employees to drive less during working hours, and children and parents to bike to school and work. 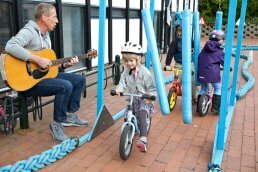 As part of the project children can train their biking skills on a transportable bicycle course that runs between daycare centres and schools in Furesø. In Furesø, children enjoy cycling on the mobile bike path, which is looked after and transported around the municipality by adults with disabilities. An important part of the project is that the bike shop Pedalartisten, responsible for transporting the bike training course, inspecting and repairing bikes, offers jobs to people with disabilities. The bikes are popular, used by locals to cycle 3,000 km per year, and the project has been a great success: 6,000 children and their parents have participated in more than 400 cycling weeks. The project and Furesø's local campaign, All Children in Daycare Bikes, have resulted in 33% of children and parents who previously drove now choosing to bike to school and work. At the shop, Pedalartisten, adults with disabilities are given the opportunity not only to learn new skills but also to achieve better social integration through meaningful paid work. The 100 Climate Ambassadors of Furesø have integrated climate action and awareness into the core activities of the municipality’s work in order to reduce CO2 emissions. The Municipality of Furesø has a population of approximately 40,000 people. The municipality ofFuresø is a result of the joining of the municipalities Farum and Værløse.